M&S have been charging more for bras sized DD or above on the grounds that they cost more to make. This 'tax' outraged Beckie Williams who founded a movement 'Busts 4 Justice' and promoted it through social media. 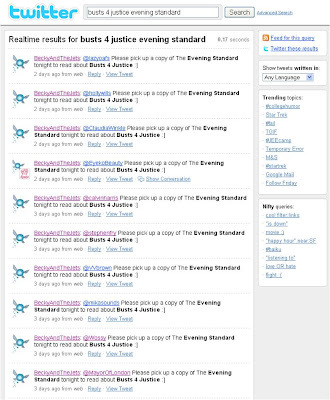 Busts 4 Justice gained significant mainstream news coverage and the Busts 4 Justice Facebook Group has quickly grown in membership - with thousands of new members and hundreds of wall posts added this week alone. but in the face of the growing online pressure, todays 'We Boobed' ad has promised price equality for all bra sizes, whilst using the opportunity to further good will by announcing a 2 week promotion across all bras at M&S. This is another example of the need to Listen to social media and react quickly in the face of problems. 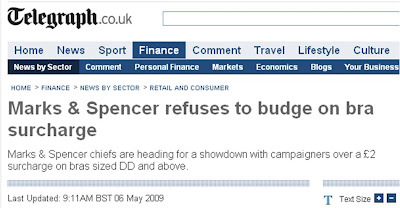 Marks & Spencer have responded today, but will today's announcement repair the damage (and maybe gain some credit) or is it too little, too late? The cost of material in making a bra is hardly significant in any case. Two cheers for the winners.